The success of the current Climate Change conference in Paris for small states will be judged by only two criteria: the limiting of global warming to no more than 1.5 degrees Celsius, and firm and binding commitments by the industrialised nations to provide financing for adaptation and mitigation without which small island developing states are in grave jeopardy. At the time of writing, the prospects for such success are not encouraging. It would be a travesty if the representatives of small states were to join the expected chorus of governments of industrialised nations that are expected to declare the conference a success even if they fail to deliver on curbing carbon emissions and on financing. A recent Oxfam report, “Extreme Carbon Inequality”, states that 50% of carbon emissions is attributable to richest 10% of the people around the world. The average footprint of the richest 1% of people globally, but mostly in the rich counties, could be “175 times that of the poorest 10%”. Small countries now have to stand-up in their own interest, and the urgency of doing so is now. There is no greater threat to the survival of all small island and developing states and the existence of many. Nothing – no other single issue or collection of issues – is a bigger or nearer dagger to the heart of small islands’ lives than climate change. As I write, developed countries’ negotiators continue to hold out against arguments from small and poor countries that any new agreement reached in Paris should commit to compensation for loss and damage caused by the impact of climate change. In other words, despite the evidence that climate change is real and far-reaching and that it has created more intense hurricanes, drought and flooding, small countries are expected to pay for the cost of damage in addition to implementing adaptation and mitigation measures. The attitude of the developed countries negotiators could not be more unjust. To be fair to the leaders of the 28-nation European Union (EU), they have persistently committed to making the cutting of emissions legally binding. But they too have been parsimonious on the provision of compensation caused by their own carbon emissions. It should be recalled that the small islands of the Caribbean and Pacific contribute less than 0.1% of carbon emissions but are the greatest victims. Also to be fair to US President Barack Obama, he has become a champion of efforts to address Climate Change. In Paris, he said: “I’ve come here personally, as the leader of the world’s largest economy and the second-largest emitter, to say that the United States of America not only recognizes our role in creating this problem, we embrace our responsibility to do something about it”. But, the US government stops short of a legally binding agreement because they know well that the US Congress is hostile to the idea that climate change even exists. Republican Presidential hopefuls have already stated vociferously that they are strongly opposed to Obama’s stand. Donald Trump, the frontrunner so far in the race for the Republican Presidential nomination declared: “While the world is in turmoil and falling apart in so many different ways, especially with ISIS, our President is worried about global warming. What a ridiculous situation." Mr Trump misses the point, effectively made by Antigua and Barbuda’s Prime Minister, Gaston Browne, in a submission to the Paris Conference that: “While terrorism is a major threat to our common humanity, so, too is Climate Change. It is arguably the greatest threat that now confronts all mankind. It knows no borders and it respects neither size nor economic and military power; it cannot be turned back by immigration controls. All of our countries are its potential victims”. Global warming has not been reduced to safe levels. 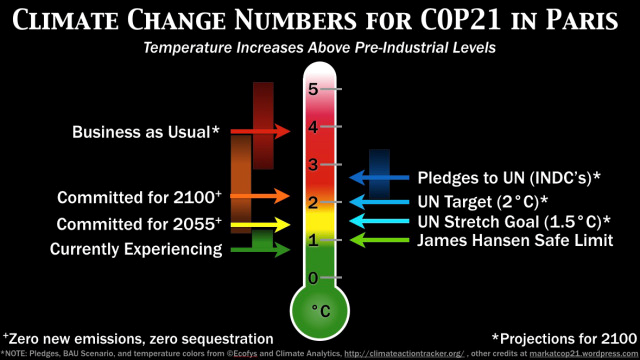 The world is currently on track for warming of at least 3 to 4 degrees Celsius by 2100. Even the current Paris parley seems to have conceded a rise to 2 degrees Celsius. The consequent sea level rise will drown several small island states and severely erode their coastal areas that are vital to tourism, agriculture and human habitats. At that level of climate change, the efficacy of adaptation and mitigation would be severely limited. Already small states have submitted their Intended Nationally Determined Contributions (INDCs) to the Paris Conference setting out plans for mitigation and adaptation. But, they cannot finance the level of ambition which they have been made to indicate. Struggling to pay debt and run the operations of their countries, they simply do not have the money. Unless the international community delivers the funds, small countries will face a progressive and inevitable slide to catastrophe. While there is tacit agreement to scale up climate finance to $100 billion a year by 2020, and a mechanism for a portion of such funding has been established in the Green Climate Fund, there is no clarity on how the six-year old commitment by developed countries will be achieved. In any event, the money is not enough and there are no iron clad guarantees that access to the Fund will not be long and onerous. Speaking at the opening of the Paris Conference on behalf of the G77 countries and China, the South African Ambassador, NOZIPHO MXAKATO-DISEKO s said: “Nothing under this Convention will be achieved without the provision of means of implementation to enable developing country Parties to address climate change. The outcome regarding finance must provide clarity on the level of financial support that will be provided by developed country Parties to developing country Parties to allow for enhanced implementation of the Convention in the post-2020 period, as well as existing commitment on pre-2020 finance”. Those remarks have stronger meaning for Small Island developing states whose societies could be rent asunder and disappear. That process has started in the Pacific where people from ancient civilisations in Kiribati, Tuvalu and the Marshall islands are seeking refuge elsewhere.